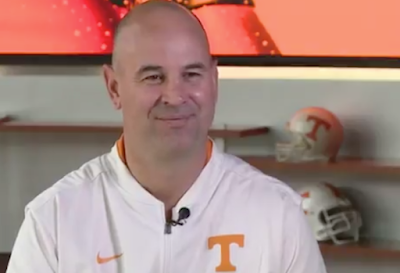 Shirts With Random Triangles: Jeremy Pruitt responds to former UGA QB Aaron Murray's negative assessment of his ability to succeed as head coach of Tennessee. Jeremy Pruitt responds to former UGA QB Aaron Murray's negative assessment of his ability to succeed as head coach of Tennessee. Jeremy Pruitt. Image via Saturday Down South. Well this didn't take long. First-year Tennessee head coach Jeremy Pruitt responded to a harsh critique of his leadership abilities from former Georgia starting quarterback Aaron Murray during his appearance at SEC Media Days in Atlanta on Wednesday. "Fifteen years ago I was a kindergarten teacher and now I'm the head coach at Tennessee," Pruitt told reporters at SEC media days. "You probably don't make that ascension without knowing how to treat people." Murray, currently an analyst for CBS Sports Radio, painted a very negative portrait of Pruitt's potential of being a successful head coach in an interview segment with Nashville-based radio personalities Jared Stillman and Floyd Reese on Tuesday. Murray also criticized Pruitt's relationship with former Georgia head coach Mark Richt while Pruitt served as Richt's defensive coordinator in 2014. Pruitt denied knowing Murray personally. Murray's college football career as Georgia's starting QB ended in 2013, a season before Pruitt was hired to be Georgia's DC.